I constantly get asked how I avoid chemicals and toxins in the laundry room. Now that people are becoming aware of the dioxins and carcinogens in most detergents (All Tide and many others) as well as fabric softener, they are wanting to make the switch. Making the switch from Downy/Bounce to a cheaper, ecofriendly, green alternative is EASY! I am here to show you how! 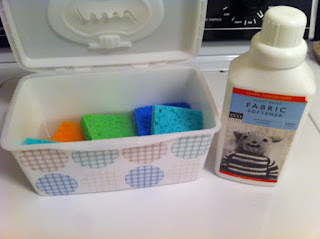 Here is my laundry room staple: homemade "Dryer Sheets"
5. When you empty your dryer simply toss your dry sponges back into the tub for future use. You will notice that your laundry is starting to get static-y again after awhile and to remedy this, simply add another tablespoon of fabric softener! Fill out the Rafflecopter Form below to enter! How about you save a few $ and purchase Shaklee's chemical free dryer sheets that are also recyclable as they are made out of paper! Totally safe, green, and easy to use!